Dr. Gina Pedersen is originally from the Los Angeles area and grew up competing in hunter/jumpers with her horse, Spanky. After high school she moved to Davis to attend the University of California, Davis for her BS in Animal Science, and stayed to complete her D.V.M. in 2010. While at UC Davis, she spent most of her free time working at the goat dairy, and even lived there for a year during veterinary school. After graduation she moved to Red Bluff, California and worked for two years as a veterinarian in a rural mixed practice, seeing mostly dogs and cats but also horses, cows, goats, sheep, and even the occasional snake. In June 2012, she relocated to Tulare County after her husband Andrew got a job in Fresno, where they still reside with their daughter Julianne and son Derek. 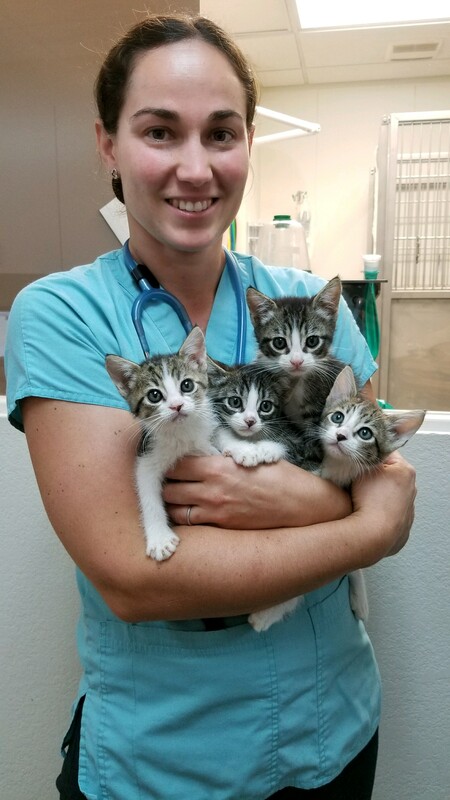 Dr. Pedersen is very passionate about pet overpopulation prevention and enjoys volunteering for low-cost spay and neuter clinics, as well as fostering kittens and educating the public about the many benefits of spaying and neutering. In her free time, she also enjoys camping, taking her horse Indy on trail rides, traveling, and hanging out with her Cavalier King Charles Spaniels, Idgie and Ocie, and her many kitties.